WeWork is rapidly expanding in NYC! So cool! September 16, 2013 05:50PM By Hiten Samtani Collaborative workspace provider WeWork continues to gobble up Downtown digs and has inked an 86,000-square-foot lease at ACTA Realty’s neo-Renaissance Cunard Lines Building at 25 Broadway, The Real Deal has learned from CompStak. WeWork will take the entire ninth and 10th floors in a 20-year lease with rents per square foot starting in the low-$30s and escalating to around $40, the CompStak data show. The office space provider will also get a little over a year in free rent in the 22-story, 858,000-square-foot tower, valuing the deal at over $56 million, the data show. The space was being marketed by CBRE’s Richard Levine, Gary Kamenetsky, Bruce Surry and Stephen Siegel, according to a listing on real estate website agorafy. Their CBRE colleague Derrick Ades represented WeWork. None of the brokers responded to comment by press time, nor did representatives for ACTA Realty and WeWork. WeWork has been rapidly expanding the size of its holdings in Lower Manhattan, home to many so-called TAMI companies — those in the technology, advertising media and information fields — which are naturally drawn to its foosball-friendly workspaces. In March, WeWork took over 120,000 square feet at L&L Holding’s 222 Broadway, in a deal that was valued at about $75.7 million, as The Real Deal reported. 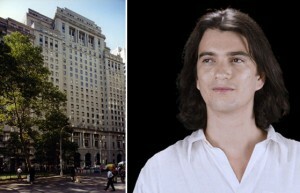 And in 2012, the company, founded by Adam Neumann, acquired the rights to buy the top 25 floors of the famed Woolworth Building for $68 million. Other flexible office space providers, such as Luxembourg-based giant Regus, have also been expanding at a breakneck pace with recent deals such as a 29,982-square-foot lease at David Tawfik’s 104 West 40th Street in Midtown.